arome realizes that the local markets leave a lot to be desired when it comes to the range of sumptuous products that we manufacture. Throughout the annals of history, spices and dry fruits have always been considered an expensive and opulent commodity. We have a craze of serving in the best to our customers, so to make their visits worthwhile we have added up more love to our bond & have come up with an amazing loyalty program. As soon as you share your mobile number at the billing counter you become arome Privileges Club’s member. You’ll earn points each time you shop with us. The points are rewarded on the basis of your bill value. The more you spend, more points and more benefits you are served with. You can start redeeming these points to pay for your bill. Join now to for luxury products at a spectacular value for money, deal & Offers. ✯	Share your number with arome at the time of billing. Earn Points according to your bill amount and redeem them on your future orders at arome. Share your Birthday/Anniversary with us & get a gift voucher of 10% discount voucher for your birthday/anniversary week. Provide us your valuable Feedback and get 25 bonus points. *Don’t Forget to Update your Profile in your Mobile App Microsite Or Simply share your birthday and anniversary dates with store Manager to Get Birthday & Anniversary Offer! Make Cumulative Purchases upto Rs.25000 & become our SILVER Slab Member and Get 3 points on every Rs.100 spent as reward points. Make Cumulative Purchases between Rs.25001 to Rs.100000 & become our GOLD Slab Member and Get 5 points on every Rs.100 spent as reward points. Make Cumulative Purchases between Rs.100001 to Rs.200000 & become our PLATINUM Slab Member and Get 7.5 points on every Rs.100 spent as reward points. Make Cumulative Purchases above Rs.200001 & become our TITANIUM Slab Member and Get 10 points on every Rs.100 spent as reward points. Visit, Shop at arome & accumulate points. The process of redeeming points is very simple and hassle free. Provide your registered mobile number at the time of billing and start redeeming your points. arome lies at the zenith of a spectrum that caters to a discerning food connoisseur. In a hitherto unexplored segment in the Indian market, arome as a food boutique is a one stop shop for luxury items. At our specialized boutique, we understand the requirements of a niche segment that appreciates quality above all other factors. To make your experience more interesting we are now here with an exclusive loyalty program which gives you opportunities to unwrap unlimited surprises. 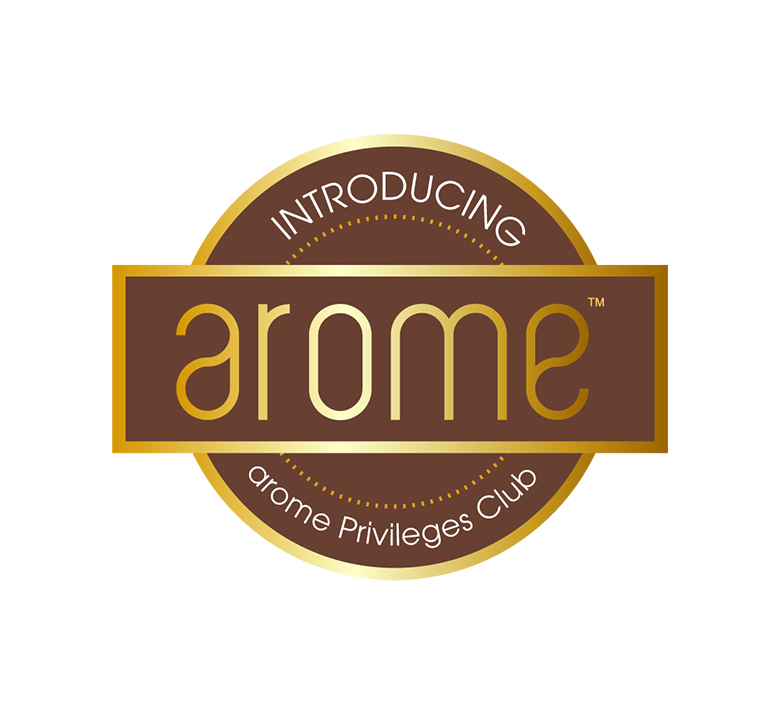 Become a member of the arome Privileges Club & earn certain points, based on your purchases - Every time you purchase with us.